BALTIMORE (Stockpickr) -- "U-S-A! U-S-A! U-S-A!" Soccer fans across the country are getting ready to root for the U.S. men's national soccer team for the World Cup match this evening. What you might not realize is that, less conspicuously, investors around the world have already been chanting "U-S-A!" all year long. Since the calendar flipped to January, the MSCI World ex-USA Index has returned a pretty tepid 3.28% gain. That's around half the performance that investors in the U.S.-centric S&P 500 have earned over that same stretch. But that's only part of the story; while overseas markets trail the U.S., lots of individual foreign stocks that trade here in the U.S. are looking downright toxic for your portfolio. Today, we're taking a closer technical look at five of them. Just to be clear, the companies I'm talking about today aren't exactly junk. By that, I mean they're not next up in line at bankruptcy court. But that's frankly irrelevant; from a technical analysis standpoint, sellers are shoving around these foreign toxic stocks right now. For that reason, fundamental investors need to decide how long they're willing to take the pain if they want to hold onto these firms in the weeks and months ahead. And for investors looking to buy one of these positions, it makes sense to wait for more favorable technical conditions (and a lower share price) before piling in. So, without further ado, let's take a look at five "toxic" foreign stocks you should be unloading. First up is Itau Unibanco Holding (ITUB, the Brazilian banking giant. Make no mistake, ITUB has posted some strong performance so far in 2014 .Shares of the $75 billion bank are up more than 16% since the calendar flipped to the new year. But after six months of rallying, this stock is starting to show signs of a top. Itau Unibanco is currently forming a double top, a bearish reversal pattern that looks just like it sounds. 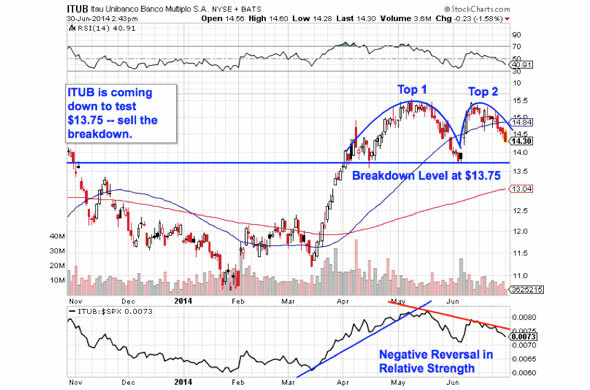 The double top is formed by a pair of swing highs that max out at approximately the same price level. The sell signal comes when the trough that separates the two highs gets violated. For ITUB, that breakdown level is right at $13.75. If $13.65 gets taken out, it's time to be a seller. Relative strength adds some extra evidence for downside in ITUB. The relative strength line has been trending lower since May, an indication that this stock isn't just dropping now, it's also dramatically underperforming the rest of the broad market in the process. Since relative strength is statistically a very good predictor of price action on a rolling three-to-10-month time horizon, it's a red flag worth watching closely in July. 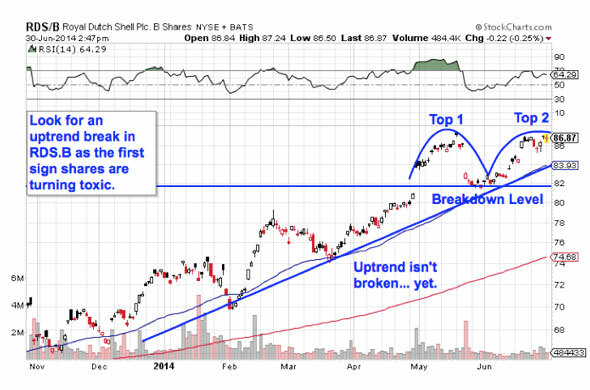 We're seeing the exact same setup in shares of Royal Dutch Shell (RDS.B. In this big integrated energy name, the breakdown level to watch is support at $82. Shell has been a solid performer for the last year, bouncing its way higher in a well-defined uptrend up to now, so while lower levels aren't a given at this point, the uptrend is definitively over if $82 gets violated. What makes $82 matter? Whenever you're looking at any technical price pattern, it's critical to keep buyers and sellers in mind. Patterns such as double tops are a good way to quickly describe what's going on in a stock, but they're not the reason it's tradable. Instead, it all comes down to supply and demand for shares of Shell. That horizontal $82 level in RDS.B is the spot where there's previously been an excess of demand for shares. In other words, it's a price at which buyers have been more eager to step in and buy shares at a lower price than sellers were to sell. That's what makes a breakdown below support so significant -- the move means that sellers are finally strong enough to absorb all of the excess demand at the at price level. If you decide to short RDS.B on a breakdown below $82, I'd recommend keeping a protective stop just above the 50-day moving average. UK-based mining stock Rio Tinto (RIO is another name that's starting to look toxic right now. RIO hasn't done much in the way of performance for the last nine months -- shares are effectively flat since the end of last October. But a sideways churn is one thing, and a free-fall is quite another; RIO looks ready for the latter in the second half of 2014. Rio Tinto is currently forming a descending triangle pattern, a bearish setup that's formed by horizontal support to the downside (at $51 in this case), and downtrending resistance above shares. Basically, as RIO bounces between those two technically important price levels, it's getting squeezed closer to a breakdown below support at $51. When that happens, we've got our sell signal in RIO -- support at $46 looks like the next nearest price floor from there. Momentum, measured by 14-day RSI, provides some foreshadowing for the downside in RIO. The RSI line has been sloping lower alongside the highs in RIO's share price. 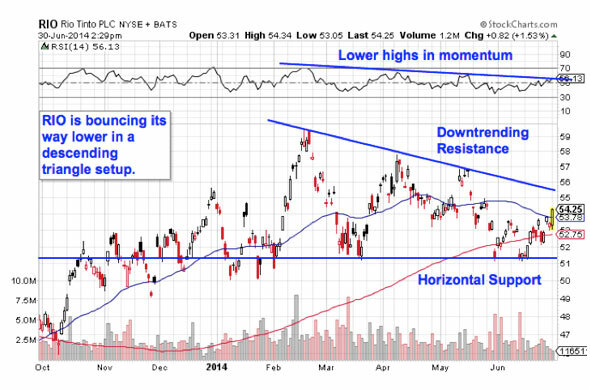 Look for RSI to break below 30 as an early warning sign before shares fall below $51 support. You don't have to be an expert technical trader to figure out what's going on in shares of WuXi PharmaTech (WX -- a quick glance at the chart should tell you just about everything you need to know about this $2.4 billion Chinese pharmaceutical firm. In short, WX looks toxic right now. WuXi is currently bouncing its way lower in a textbook downtrending channel. The setup is formed by a pair of parallel trend lines: a resistance line above shares, and a support line below them. Those two lines on the chart provide traders with the high-probability range for WX's shares to stay within. When it comes to trend channels, up is good and down is bad. It's really as simple as that. And as shares bounce off of trend line resistance for a sixth time in this short span, it makes sense to sell the bounce. The 50-day moving average has been a solid proxy for trend line resistance on the way down, so until that level gets taken out, expect more lows in shares of WX. 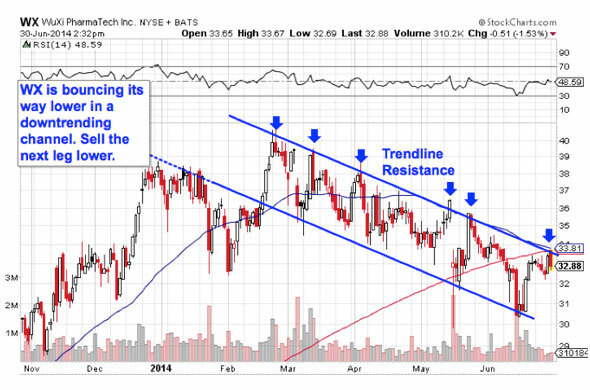 China Mobile (CHL is another Chinese stock that's showing us a tradable downtrend this week. CHL's toxic price action has been much longer-term than the downtrend in WX: China's largest wireless provider has been bouncing its way under a falling resistance line since back in September. Now it makes sense to sell the next bounce lower off of that resistance line. Waiting for that move down before clicking "sell" is a critical part of risk management for two big reasons: First, it's the spot where prices are the highest within the channel, and alternatively, it's the spot where you'll get the first indication that the downtrend is ending. Remember, all trend lines do eventually break, but by actually waiting for the bounce to happen first, you're confirming that sellers are still in control before you unload shares of CHL. CHL's downtrend hasn't exactly been textbook over the last year. 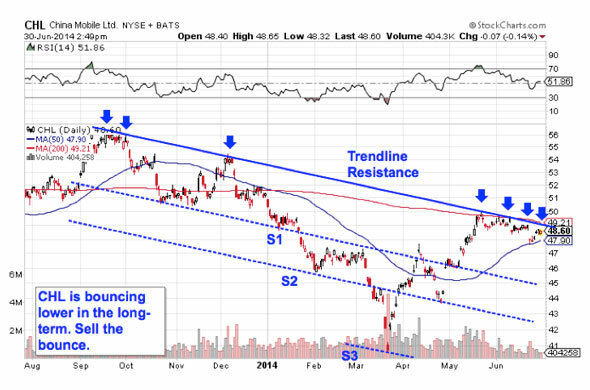 While resistance has swatted shares lower consistently, support has been defined by three levels instead of just one. That lack of a single solid price floor is an important indication that buyers are lacking in shares of CHL right now. That means that China Mobile is likely to end the summer significantly lower than it started.